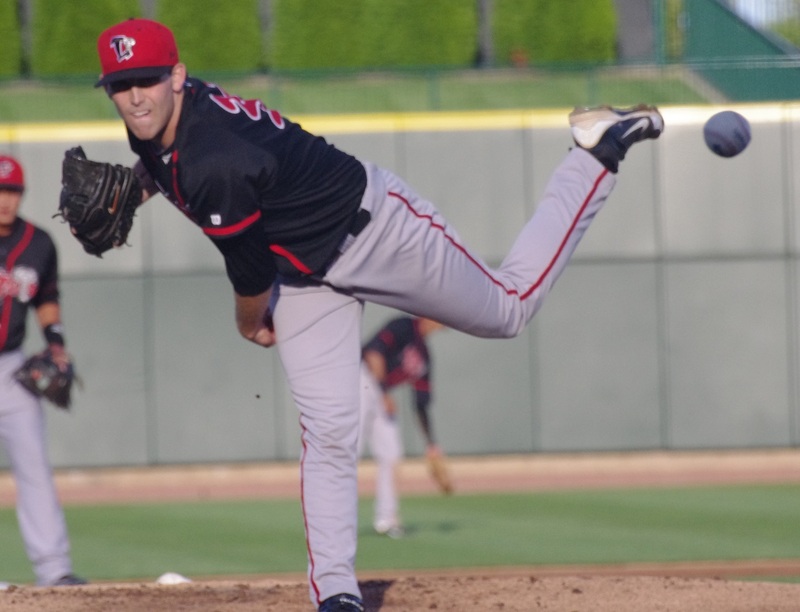 My second scouting report is on another new Lansing Lugnut, starting pitcher Matt Boyd. Boyd was the Blue Jays’ 6th round pick in 2013 and joined 8th rounder Kendall Graveman and 9th rounder Chad Girodo (scouting report coming soon) on the Lugnuts’ roster after they signed with the Blue Jays. Boyd was the ace of the Oregon State Beavers as they went deep into the College World Series this year. 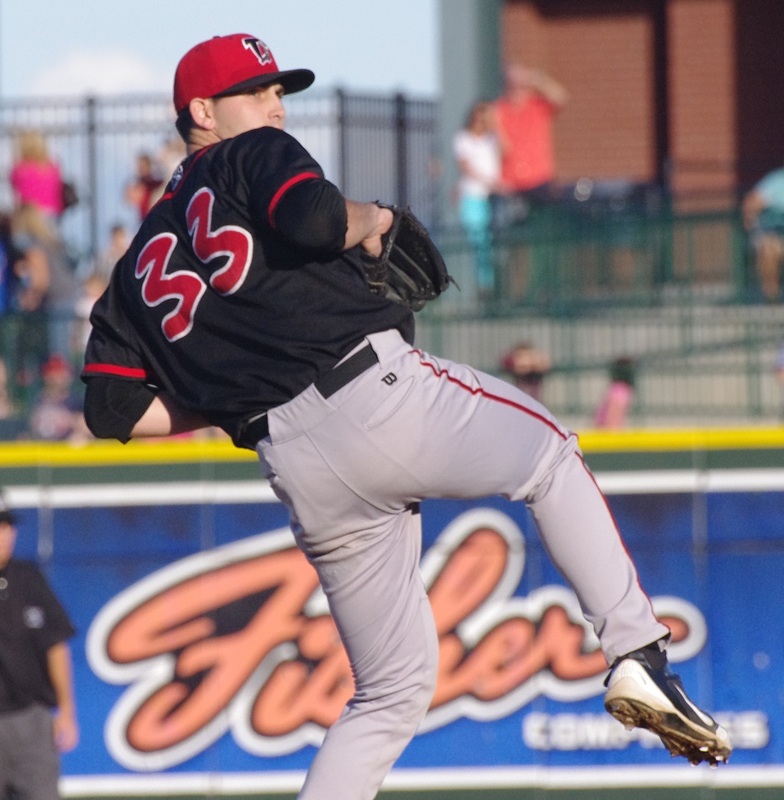 I saw Boyd pitch against a fairly weak Great Lakes Loons lineup but he went through them very effectively. Boyd is a tall (6’3″) lefty who isn’t necessarily making the radar gun pop. I had his fastball (looking on at scouts’ radar guns) sitting around 88-89 mph with the occasional 90. He throws the fastball well and was definitely looking to hit his spots, particularly on the outside corner with it. He throws a circle changeup in the 76-78 mph range and he wasn’t as consistent with it. When he left it up, it could just sit there and the only hit he gave up came on an elevated, flat changeup. A scout pointed out to me that he did throw some better ones that had some tail (arm-side movement). One of these was popped up to the second baseman and another got a swinging strikeout in the fifth inning. His curveball has some very sharp bite as well as good two-plane movement. He threw it in the 71-75 mph range. He didn’t have as much control with the curve and bounced it in several times. Personally, I like the pitch better when he throws it a bit harder, getting less movement, but a sharper break and a little more command. Boyd might be in kind of a Mark Buehrle mode right now. 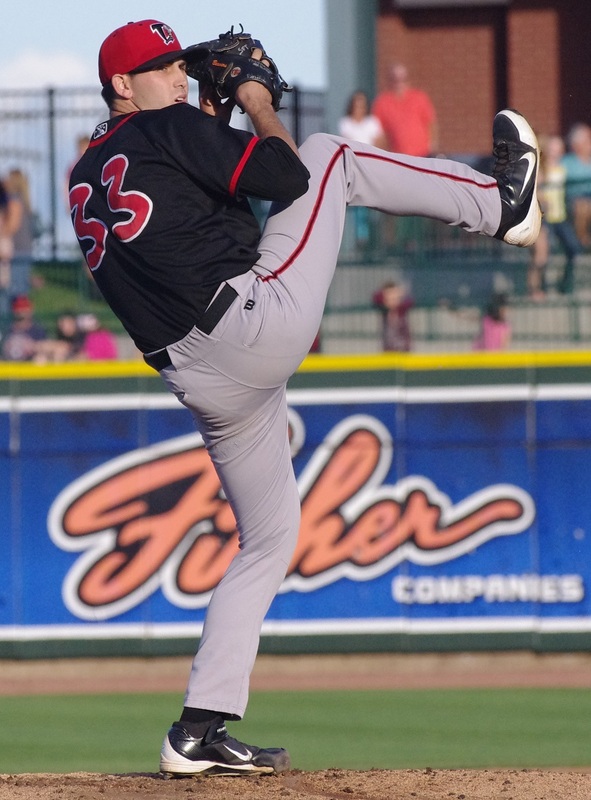 He’s been giving up a lot more fly-ball outs than ground balls, and this could come back to haunt him when he’s not pitching in such a pitcher-friendly ball park like Cooley Law School Stadium in Lansing. He definitely has excellent control, walking only one batter so far in his first 14 professional innings (to go along with 12 strikeouts). That walk came in his first inning on Saturday in which he looked like it took him a little bit of time to get comfortable and settled on the mound. The only runner he gave up after that inning was the leadoff double in the fourth that he stranded there. As far as Boyd’s mechanics go, I’m not sold. He has a very high leg kick and his weight seems to be very far back behind his leg as he’s pushing forward to home plate (see photo above). He ends up looking very balanced however and gets himself in a much more conventional pitching position when he’s delivering the ball. This technique may end up helping him hide the ball from batters better. I’m not sure how he’s going to be with runners on first, as he didn’t have to deal with many base runners in the outing that I saw, but the big leg kick from the windup could make for significant mechanical differences between his windup and the set position. It might also make it difficult to keep runners close. Overall, Boyd shows excellent poise on the mound as well as control, making his fringe-average fastball play up. His changeup is a little inconsistent at times but shows the potential to be a solid pitch and his curveball shows a little more potential than that. I have a feeling that his fastball may be a little low on the velocity side right now due to fatigue. He’s pitched a lot this year and I’ve read reports that his fastball touched 94 early in the year. One of the things he talked about in our interview is building his endurance, so it’s clear that he knows that he’s not throwing the ball as hard as he did earlier in the year and is working to be able to maintain that throughout the long, professional season. If he’s going to be able to sit in the low-90s consistently as a professional starting pitcher, I could easily see Boyd splitting 2014 between Dunedin and New Hampshire and with some more polish and consistency from his secondary pitches, could be a guy that comes through the system a little bit under the radar to be seen as a back-of-the-rotation starter in a couple of years. Tune in to this week’s upcoming Blue Jays from Away podcast to hear from the man himself in my interview with Matt Boyd. I wanted to comment on the piece about holding runners. Matt was great at picking off runners while at Oregon State. I’d watch the College World Series games he pitched in. He had several pick offs. Thanks so much for your input Erik!